I had an image in my head when I was typing this of a mama monkey saying “Hang on & hold tight” to her baby as they were going to make that first leap of the day to swing from tree to tree. Their path for the day was many feet off the ground. It is so important to hang on and hold tight when you are swinging from a tree. But what does this really mean when you are not? When we are starting down a new path- exploring an unknown region in our lives – a new relationship. we feel that we are taking a leap down a rabbit hole or off a cliff. We are not sure where we will end up but we are trusting that we are doing the right thing. We are going to hang on and hold tight to ourselves and see what happens. 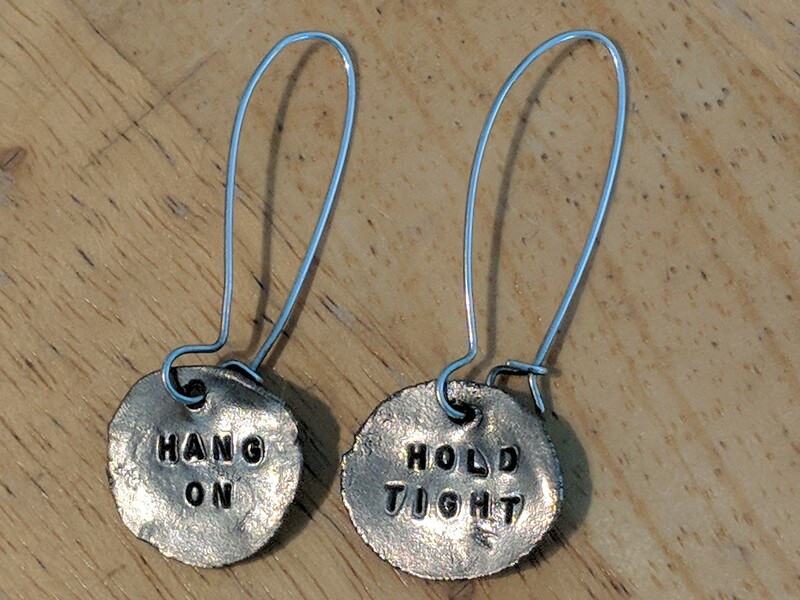 I bought these earrings several years ago when I was literally exploring a new relationship. I was hoping this was going to be the one that would work out. So I bought the earrings as a way to say to myself, OK I am going to try and see how it goes. And it didn’t and I fell down. But I dusted my self off and said OK that was a fall. And I did not end up feeling good. But I learned some things about myself and what I want and don’t want in a relationship. I am OK. The important thing is to try and see what happens. We are excited – scared – thrilled – laughing all the way. What a rush! And if we do end up losing our grip and falling, we need to pick ourselves back up and try again. We also need to know when we need to let go, when something is not working out so well or when someone is hurting us. We need to recognize when it is time to let go and move on. I feel allot of this is about trust. Trust in ourselves to know or recognize what we are holding onto. Is it better to just let go and try walking in another direction? Should we be following a different path? When was the last time you felt this? Telling yourself that you need to hold on and hang tight? Whether literally zip lining over a lake or jumping into a new situation?